In this weeks episode I will be discussing The Cairn on the Headland by Robert E. Howard. The Cairn on the Headland first appeared in the January 1933 issue of Strange Tales of Mystery and Terror. It can be classified as a Cthulhu Mythos type tale, but more steeped in Norse Mythology and Irish history than Lovecraft’s aliens. . The Cairn on the Headland focuses on an American named James O’Brien. The story is set sometime in the 1920’s near Dublin, Ireland, O’Brien an archaeologist or possibly anthropologist is there under the pretense of a vacation, but in reality he was forced to come by a man named Ortali. For several years Ortali has been using an unfortunate incident in O’Brien’s past to blackmail him. I would like to thank David Drage, AKA Ironmammoth for allowing me to use his reading of The Cairn on the Headland. In this weeks episode I will be discussing A Night in Malnéant by Clark Ashton Smith. It’s a short story that was first published in June 1933, in a collection titled “The Double Shadow and Other Fantasties”, which Smith published himself. The story would later be reprinted in the September 1939 issue of Weird Tales. This is not part of any particular cycle within Smith’s body of work, it is a stand alone Weird Fantasy story. It deals with a nameless narrator who wanders into the gothic city of Malneant and spends an unusual mist shrouded night there as his past appears to catch up with him. It’s a pretty interesting story and is wonderfully told. Thanks to the generosity of Will Hart, aka CtulhuWho1, I have included a recording of noted fantasy writer Fritz Leiber reading the story from the 3rd World Fantasy Convention on October 29, 1977 in Los Angeles, California, where Clark Ashton Smith was the theme. Will was in attendance for the reading and thanks to him it will last forever. Be sure to check out Will’s site and Flickr page for a ton of great audio and visual goodness when it comes to classic dark fantasy tales. His site is located at cthulhuwho1.com. I’ll put links to both his site and flickr page in the show notes. In this weeks episode I will be covering a short story by H.P. Lovecraft, The Evil Clergyman. The story was first published in the April 1939 issue of Weird Tales. The short story is actually an excerpt from a letter Lovecraft wrote. It features a nameless narrator who seems to be investigating a room that once belonged to a well.. Evil Clergyman. I’ve included an audio version of the story which I obtained from archive.org. I hope you enjoy it. 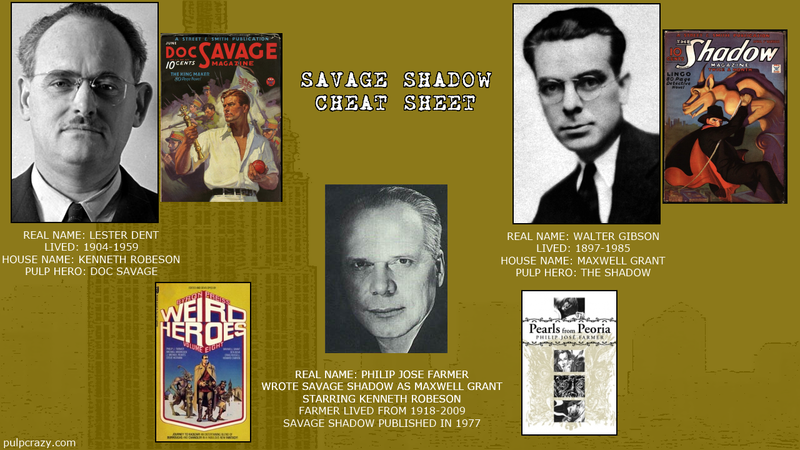 A recording of David Saunders presentation on pulp artist James Allen St. John from Pulpfest 2012. J. Allen St. John is well known for providing illustrations to the works of Edgar Rice Burroughs when they appeared in pulp magazines. In this weeks episode I will be discussing The Scarlet Jaguar, an original Pat Wildman adventure by Win Scott Eckert. The Scarlet Jaguar was originally published by Meteor House Press in a limited edition signed paperback and debuted at Pulpfest 2013. It has made headlines recently due to it winning 2 of the 2013 New Pulp Awards. It won the award for best novella and the award for best cover art by Mark Sparacio. Recently Meteor House has put it out via eBook and is now available on Amazon for $3.99. I will be discussing the Scarlet Jaguar and giving a brief overview of The Evil In Pemberely House (the first Pat Wildman adventure co-written by Philip Jose Farmer and Win Scott Eckert) as well as the character of Pat Wildman herself.